This is the second week of #cyberpd, a virtual book talk, that I am participating in this summer. 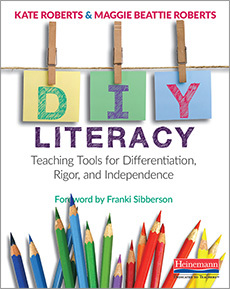 Those in the #cyberpd community are reading and discussing DIY Literacy: Teaching Tools for Differentiation, Rigor, and Independence by Kate Roberts and Maggie Beattie Roberts. This week our focus is chapters three and four. As I was reading chapters three and four of DIY Literacy I felt as if the authors, Kate Roberts and Maggie Beattie Roberts, must have been in my classroom alongside me at some point. They described challenges in teaching and learning that are all too familiar. Their description of a teacher reading student work that doesn’t show any evidence of the new strategies she taught or students finishing a task that should have taken much longer are all too real to me. Reading these descriptions made me think the authors just took a page from my day-in-the-life-of-a-literacy-teacher story. This speaks to how relevant this book is for me. As I was reading there where parts, such as when I read this, “Your students can be more thoughtful about what strategies they use in their reading and writing, and they can hold onto your teaching as time goes on” (p. 39) that I was thinking, Please, tell me HOW! Of course, Kate and Maggie do not disappoint. They have provided some insightful ideas to work through the instructional challenges that I’m sure all teachers must face. With all the teaching students are exposed to on a daily basis, they have a lot to remember and charts can help them remember and develop automaticity with the strategies they are learning. When students have charts to refer to they can be thoughtful about the use of strategies and make independent decisions about strategy use. Teachers and students need to live the chart. Tips to make frequent references to the chart, add strategies to the chart during follow-up lessons, and give students the opportunity to reflect with a partner about their use of strategies help to make the chart a useful tool as opposed to a poster that hangs on the wall. Charts and other tools are scaffolds and should be temporary. Students can be involved in the process of removing the charts with practices, such as polling them to see which ones they think can be “retired” and challenging them not to use the chart. Rigor isn’t only about the complexity of the task, but also about the work and effort that students put forth when engaged in a task. Rigor may be lacking because students aren’t clear on expectations for the task they are being asked to do. Micro-progressions are a tool used to show students the expectations so they know what to do to work hard at a task. Rigor is linked to motivation. Students will work hard when they are challenged, curious, given control, engaged in collaborative work, and recognized for their hard work. Next week I will be posting a reflection on chapters five and six, as the #cyberpd community continues reading and discussing the book. Thank you for sharing. I like how the authors gave me a better definition of rigor. Rigor is not just tasks that are harder. It is also about the effort and motivation the student puts into the work. I felt like students will be taught to move from "Good to Great". I think rigor, defined as more and more complex text, is the more common perception. We can increase the complexity as much as we want, but if students aren't able to put in the effort to work through a text then they aren't going to benefit. I think micro-progressions are a great way to get students to increase the rigor. I also liked how they talked about lifting the scaffolds or tools, when kids are ready! Sometimes I think we just keep it going if it's successful, but if our goal is to move kids towards independence, removing the scaffold is necessary! Thanks for the post! Yes, when tools are there for students to access all year I think they learn to rely on them too much and they just won't get to the point where they are independent with the strategies. I really appreciate your lists of "take aways" for each chapter! Two points you make that resonate with me are the 'temporary' nature of the scaffolds and the link between rigor and motivation! As our students gain and internalize skills and they become more automatic, we should be able to move supports thus making room for more! I view rigor through the eyes of the student...what will engage and interest them? "Harder" text doesn't mean rigor. Students can be just as challenged with a picture book as they can with a complex novel. Rigor is what the learner brings and the learner is more inclined to approach a text or task with rigor if they are motivated in some way by it. Yes, it is true when you say that students can be just as challenged with a picture book as they are with a complex novel. I was at an institute with Jan Burkins and Kim Yaris and they read a literary piece that was written about an early reader book, Go, Dog, Go. The literary piece was complex and insightful. Although the book was a simple one the thinking that the writer was doing was complex and definitely rigorous. The depth and complexity of students' thinking is one way rigor can come into play.